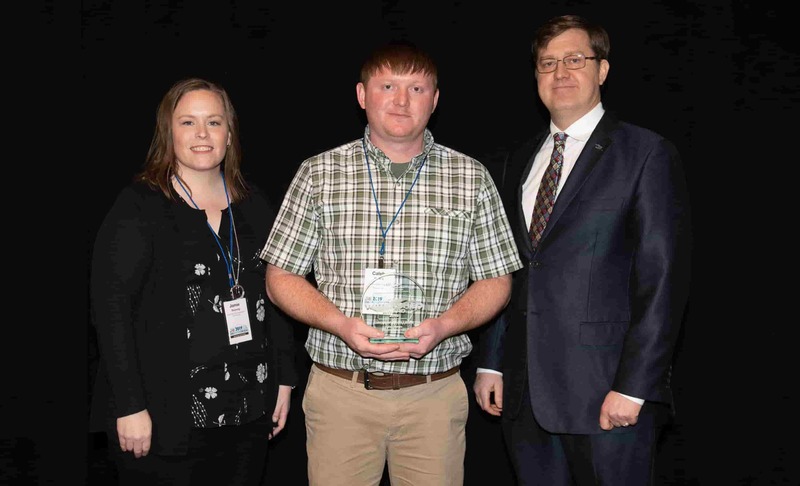 AMES, IOWA – Caleb Waters, watershed coordinator for the Lake Geode Watershed Project, was honored yesterday with the Circle of Excellence award from the Iowa Agriculture Water Alliance (IAWA) as part of the second annual Iowa Watershed Awards program. Waters was honored alongside four other watershed coordinators who also received IAWA Iowa Watershed Awards for their multitude of contributions and steadfast dedication to improving water quality across the state. IAWA Executive Director Sean McMahon and Iowa State University (ISU) Extension and Outreach Water Quality Program Manager Jamie Benning announced these recipients at the 2019 Iowa Water Conference in Ames, Iowa. Waters was recognized with the Circle of Excellence award because of the diversity of partners working together to improve soil health and water quality through his project and his successful outreach. The Lake Geode Watershed Project is one of the largest partner-based projects across the state, involving conservation efforts on both public and private lands. These partners include the Iowa Department of Natural Resources (DNR), Natural Resources Conservation Service, Henry & Des Moines County Soil and Water Conservation Districts, Iowa Department of Agriculture and Land Stewardship (IDALS), U.S. Environmental Protection Agency (EPA), Iowa Farm Bureau, Southeastern Community College, Iowa Corn, Iowa Learning Farms, Henry & Des Moines County Conservation Districts, Tri-Oak Foods, Green Valley Seeds, Casey’s General Store, ISU Extension Offices, and Women, Land and Legacy. The watershed has had big interest in best management practices (BPMs) resulting in a lot of landowner involvement with the project. “No-till, strip-till, and cover crops are some of the practices producers are using to reduce soil erosion and improve soil health on their farms,” Waters says. He sees landowner support and involvement mainly through the implementation of terraces, waterways, ponds, and septic upgrades. Lake Geode is one of the first projects in the state to offer cost-share to update failing septics. Along with the great work being completed throughout the watershed, 29 structures have been built within Geode State Park and on the park boundary line. Waters was instrumental in working with many landowners and the Iowa DNR to coordinate efforts from start to finish. The benefit of these structures has greatly reduced the overall sediment and phosphorus load reductions to the lake. To help maintain momentum for this work, Waters will receive funding through the IAWA Iowa Watershed Awards to apply to the Lake Geode project as well as funding for his own professional development. Waters grew up about five miles away from Lake Geode. Growing up, Waters had the opportunity to work at Lake Geode for the DNR as a seasonal employee, giving him a strong foundation of the area early on. He has found that outreach to the community, and not only to producers, has been critical to the success of the project thus far. “Outreach is huge and plays a big role in my position — trying to educate both producers and the community about the project,” Waters says. He has had success with sharing posts to Facebook that, “really get the word out about what we’re doing.” The Lake Geode Park’s page has nearly 4,000 followers, which has allowed him to inform a bigger audience than ever before about the ongoing water quality efforts taking place. Additional outreach includes hosting numerous field days, events, tours, and presentations throughout the year. IAWA developed the Iowa Watershed Awards program with ISU Extension and Outreach, Conservation Districts of Iowa, IDALS, and the Iowa DNR. The Iowa Agriculture Water Alliance (IAWA) is increasing the pace and scale of farmer-led efforts to improve water quality in Iowa. Founded in 2014 by Iowa Corn, the Iowa Soybean Association, and the Iowa Pork Producers Association, IAWA is building public-private partnerships focused on implementing water quality solutions. Iowa farmers are actively engaged in various conservation efforts that improve water quality. Learn more at www.iowaagwateralliance.com.